Alex graduated from Coventry University with an Illustration degree and won second place in the Macmillan Prize for Children's Illustration. 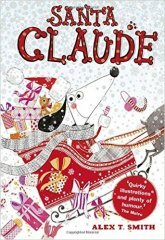 Claude won the 5-9 young fiction Sainsbury's Children's Book Award, was selected for the Waterstone's Children's Book Prize, and is soon to be a TV star on Disney Junior. Alex T. Smith is a World Book Day Illustrator. This was my Xmas gift. Everybody has loved it.